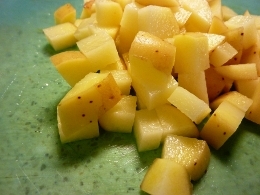 Chop potatoes. 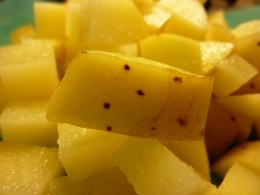 The recipe suggests one large russet potato, but I used two medium, unpeeled Yukon Gold potatoes. Saute onion in butter and seasonings (salt, sugar, cayenne pepper). The recipe calls for “ground red pepper.” I used cayenne pepper. Does anyone know if this is the same thing? I am thinking not. My soup was SOUPER hot! 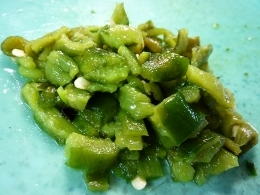 (But I didn’t mind it – I love hot foods.) 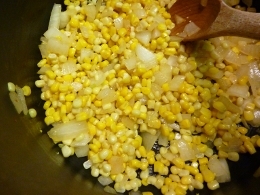 Add thawed frozen corn. 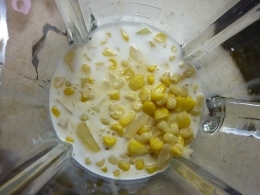 Remove a portion of the corn mixture and puree in a blender with half-and half. Add it back to the soup. 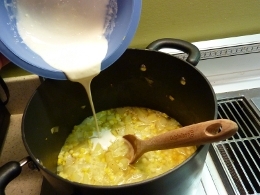 Add a mixture of flour whisked into half-and-half, plus milk, and your chopped poblano. And of course, the star of the show: the CRAB! I used one can of “fancy lump” (a.k.a. : $$$), and one can of “premium white” (a.k.a., I saved a couple bucks). 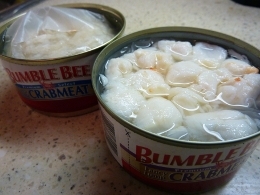 All real stuff though, no Krab here. 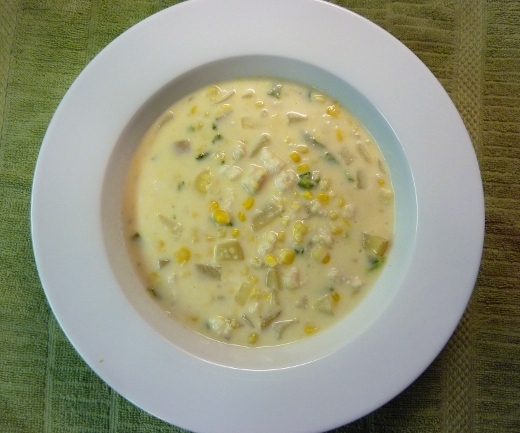 I loved the contrasting flavors in this chowder. It was HOT! I mean, it looks pretty innocent in this picture, right? But man-oh-man, it packed a lot of heat! 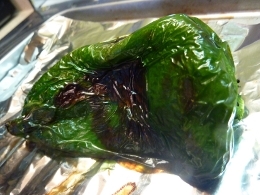 I guess 1/4 tsp of cayenne pepper + 1 poblano pepper = hot! Not only was it hot, but it was also quite sweet, from the corn and crab. And also quite creamy and luscious. Pretty darn good. As a side note, tonight I realized that hot foods are great for portion-control! As much as I loved this soup, I stopped eating it earlier than I probably typically would have, because it was hot hot HOT! My nose was running, the same way it does when I eat “hot”-sauce wings at Bdubs. This is a good thing folks. And actually, I made this soup yesterday (Sunday)! All I had to to when I got home tonight was heat it up, and add in the crab. Easy peasy. I am loving cooking things on the weekends, and then being able to come home and eat tasty, healthy homemade meals with minimal effort. Thank GOODNESS today is a three-day work week. I about hit my tipping point today. I’m just tired of dealing with people. Incompetent people. A long weekend is much-needed. ♪♫ Currently listening to: I’m Only Happy When It Rains – Garbage.